The Adjustable Height Table Base allows you to raise and lower your work surface and monitor throughout the day, enabling you to sit or stand while working. Heavy duty lifting capacity of 330 lbs (150kg). 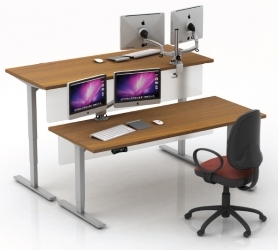 3-stage legs offer added strength and large height adjustment range of 24.5” to 50” (62.23cm to 127cm). Quick and quiet adjustment speed of 1.5” (3.8cm) per second. LED readout for height position. 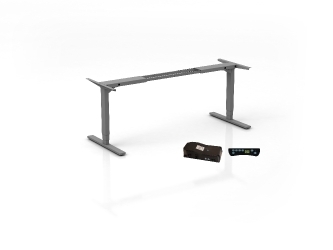 Work surface support frame width adjusts from 42.25” to 74” wide (107.315cm to 187.96cm). Sturdy steel constructed with powder-coated finish. Plugs into standard 110 outlet. Control box and motors are UL and CE certified. Note: Only the table base and control box is included.